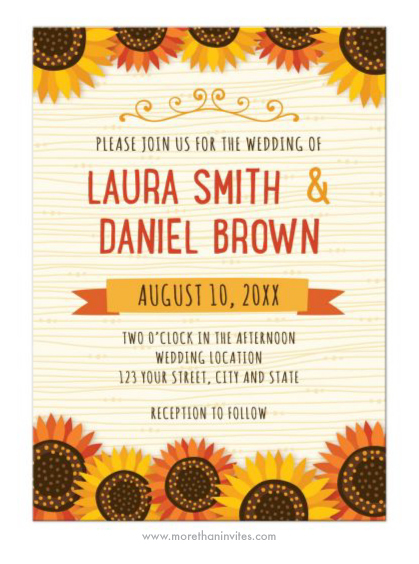 This cute wedding invitation has yellow and orange-red, whimsical sunflowers arranged as borders top and bottom on a background inspired by wood or woodgrain. A swirly, yellow-orange scroll ornament adorn the invite above the text and there is also a ribbon banner. Warm yellow and orange-red colors, perfect for a late summer or fall/autumn event with garden or sunflower theme. Matching RSVP card is available.